June 2015: Ryan Cassata speaking at the first ever Beatnik Shindig Conference after being recognized by the Beat Museum founder for carrying the spirit of Allen Ginsberg. Ryan Cassata becoming the youngest speaker (18 years old) to ever deliver a keynote address at the largest transgender conference in the world, the Philadelphia Trans Health Conference. 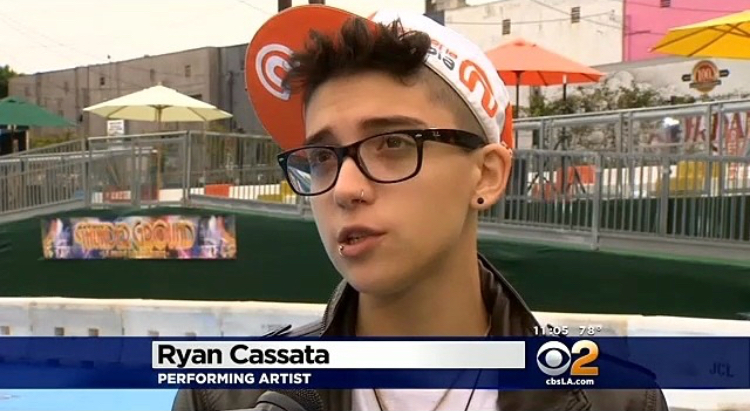 Since coming out as transgender in his early teens, motivational speaker and singer/songwriter Ryan Cassata, has become a powerful, globally recognized advocate for equality, bullying and related LGBT issues for one simple reason: “I don’t want any youth to feel alone in their journey.” Gaining initial renown for his appearances on Larry King Live, The Tyra Banks Show and ABC’s “Heads Up,” the multi-talented 24 year old has toured the U.S. frequently, addressing thousands and thousands of high school, college and university students on the importance of acceptance. His advocacy has earned him features in several prominent magazines and films and he was the star in documentary “Songs For Alexis.” In 2012, Ryan became the youngest keynote speaker ever at the Philadelphia Trans-Health Conference. Cassata’s message inspires and motivates all students to make positive change within their communities, regardless of their background or whether they are LGBT or not. Ryan Cassata uses speech, spoken word, video and original music to tell his personal coming out & transition story. Each performance is capped off by a question and answer session to give students and faculty the opportunity to learn about the things that interest or concern them and their school. Speaking Topics Include: Coming out to friends & family, coming out in school, early transition, gender dysphoria, being transgender in the media, transgender terminology, transgender surgeries, positive expression, creating positive change within a community, question & answer, and more. Please include the name & location of your school. Thank you. A short film created by Ryan Cassata to educate viewers about gender dysphoria, chest binders, and the necessity that gender confirmation surgery is for so many.